As the production cost is increasing in India, the buyers and the manufacturers are heading to lower cost destinations like Bangladesh. The exodus is happening at a faster pace. Indian industry has passed its prime without even attaining the maturity. The challenges are same but the solutions were never ever effectively implemented. It is the time to introspect and reframe the solutions. Firm determination and dedication is required to reverse the tide. A thorough analysis is imperative to arrive at doable and practical solution. Though the export value of Indian Readymade Garment has grown at CAGR (2005-13) 8.5% more than the global rate of 5.9%, this however does not signify the growth of Indian apparel industry as the value increase has not actually transpired in to the quantities which are almost stagnant. 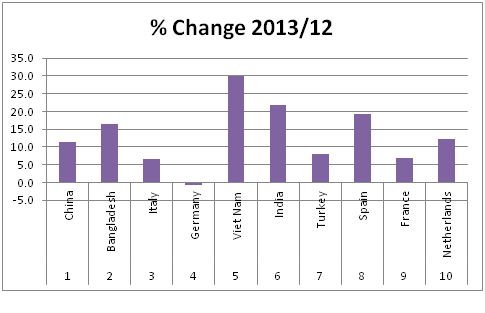 India slide to 6th place in 2013 from 2nd position in 2005. Bangladesh and Vietnam emerged as a preferred sourcing location. 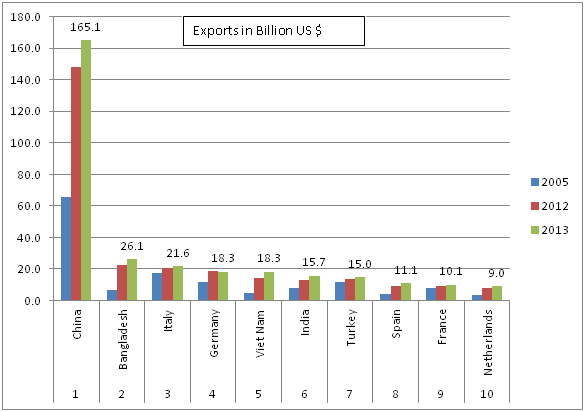 India can’t be compared with Italy and Germany as the product exported differs widely. Germany primarily exports specialized and high end technical textile product while Italy is known for its high value Designer garments. 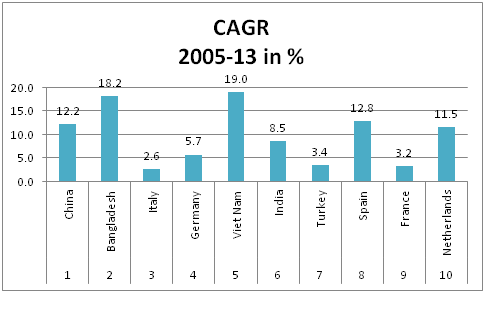 Growth of Bangladesh and Vietnam has outstripped the growth of India by a huge margin. There are many macro economic reasons which were responsible for the slow growth of Indian industry. After the abolition of Quota regime in 2005, Indian industry was very optimistic; this optimism coincided with the positive economic outlook (2002-2007). Industry leaders chalked out big plans and expected to close the gap with china. Even Global fund houses were positive and flushed the garment industry with funds. But the euphoria didn’t last for long as the global recession (2007) caved in the demand from the biggest garment importer “United States”. The industry was not ready for this rude shock as Indian industry was not diversified and primarily supplies to U.S market which was in extremely bad shape. The capacity which was created to accommodate the expected growth after the abolition of quota was redundant and capacity utilization was very low. Optimism was soon replaced by pessimism, Industry was in reactionary mode, and emergency measures were taken. But the damage has already happened, business sentiments hit a new low which will be difficult to reverse. The industry was too careful to make new investments in terms of new technology and skilled man power. Industry also lost its low cost advantage to other developing countries as sufficient measures were not taken to offset the rise in prices. Indian garment industry is dominated by small players with very few professionally managed companies. These companies lacking the long term vision and just focuses on immediate challenges. Recent data available gave good signs of revival but requires positive economic outlook combined with the efforts from industry barons who need to make appropriate capital budget provisions to maintain the competitive edge regardless the short term economic problems. Ashish Kumar Gupta is a Master of Fashion Technology from NIFT and he holds a Bachelors degree in Textile Technology. He was associated with Madura Exports as Assistant Quality Manager for two and half years. At present he is working with Lovely Professional University as an Assistant Professor. Indian Garment Industry and comparative analysis with other leading ready-made garment manufacturing countries.